Location: Lough Erne in County Fermanagh, Northern Ireland. Ownership / Access: Crichton family, Earls of Erne, managed by National Trust. Notes: Crom Castle is situated on the shores of the Upper Lough Erne in County Fermanagh, Northern Ireland, and set within a 1,900-acre (7.7 km2) estate. The present structure was built in 1820 and, although Queen Victoria's reign began in 1837, the building was built in the Victorian style and has been the home to the Crichton family, Earls of Erne for centuries. Crom Estate also contains the ruins of the Old Castle, a tower house, which was previously owned by the Balfour family until the Crichtons acquired it in 1609. 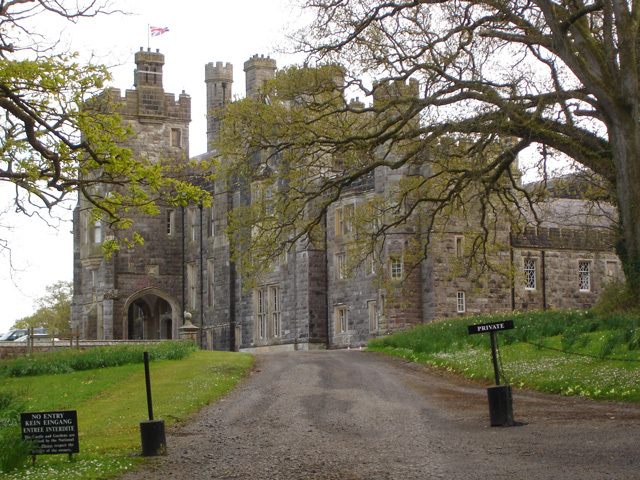 The castle is privately owned by the Crichton family, Earls of Erne, and the estate is managed by the National Trust. The estate includes many features of times past including the old farmyard and visitors centre, The boathouse, once the home of Lough Erne Yacht Club, the tea house, the church, schoolhouse, etc. Guests are able to use the west wing for weddings, or to stay in the West Wing of Crom Castle on weekly or long weekend basis. Crom Old Castle and garden (grid ref: H3645 2380) are Scheduled Historic Monuments.